I was one of four people to walk across Australia as part of Australia's Bicentennial in 1988. March 1st - September 14th. Sharks Bay to Byron Bay. 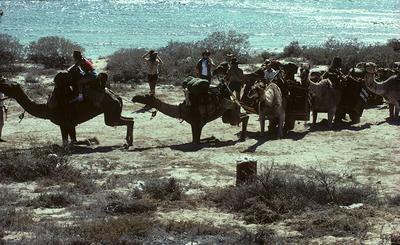 The trek was ten segments and we had 15 camels to carry everything including water. About every three weeks new short term trekkers would arrive with new supplies and some trekkers would leave. We walked 401 miles in 20 days of walking and endured high temperature of 112 degrees Fahrenheit (45 Celcius) in the shade.